is a leader of photovoltaic group at department of electro-technology and prominent researcher in this domain. He deals with problems of physics, construction and technology of photovoltaic cells, diagnostics of semiconductor cells and optimization of photovoltaic systems. He is also a supervisor of bachelor, master and postgraduate students in photovoltaic field and gives lectures on Solar Energy Systems and Photovoltaic Systems. Finally, he is a founder and scientific leader of Laboratory of Photovoltaic Systems Diagnostics. deals with measuring of parameters of photovoltaic cells under different conditions utilizing a commercial PASAN tester and assessing of thermal characteristic. He also operates a demo 3 kW photovoltaic system including optimization of tilt angle, on-line monitoring of operational data and assessing of influence of operational conditions on system functioning. deals with applied informatics and modelling of enterprise systems. Within a scope of photovoltaic group provides realization of the web site interface for presentation of on-line measured photovoltaic data. He also engages in the project management and FMEA method utilized for operation and construction of photovoltaic plants. deals with diagnostics of photovoltaic modules utilizing a commercial tester PASAN Sun Simulator 3c. He is a chief of Laboratory of Photovoltaic Systems Diagnostics. deals with diagnostics of photovoltaic modules utilizing a commercial tester PASAN Sun Simulator 3c. He is also a quality manager and expert on metrology of Laboratory of Photovoltaic Systems Diagnostics. deals with simulation of photovoltaic systems utilizing SCADA industrial control system and programmable power supplies. He also engages in influence of different types of photovoltaic modules on convertor functioning. deals with physics of thin layers of polycrystalline silicon photovoltaic cells and optimizing of process of passivation utilizing water vapour. He is also outside worker of the Academy of Sciences of the Czech Republic. What research we deal with? LBIV (Light Beam Induced Voltage) - scanning of PV layers for defects determination by local irradiation of monochromatic light of different wavelengths. Measuring PV cells V-A characteristics and parameters by different conditions on professional PV cell tester PASAN IIb. Temperature dependencies of PV cells characteristics evaluation (lighted and dark). PV modules V-A characteristics and parameters measurements by different irradiance using professional PV module tester PASAN Sun Simulator IIIc. Optimization of PV modules tilt angle. On-line monitoring and evaluation of operating conditions influence on PV system function. On-line imaging of system operating values on Internet. PV systems diagnostics provides information about PV system performance in real and simulated conditions as well. It is possible to optimize the function of PV system, or power plant respectively, by regular diagnostics and achieve its longer life and yield. The area of PV cells diagnostics brings information about influence of construction and technology on final characteristics and parameters. Information obtained creates feedback for manufacturers and contribute to PV cells production improvement. The area of PV system operation deepens knowledge about performance of PV system in real conditions and contributes to operation optimization. What are we specifically working on? 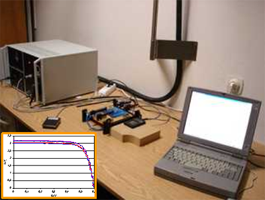 On-line imaging of operating values of demonstration PV system on Internet. Nowadays, our research is financed from institutional research plan MSM6840770017 - Development, Reliability and Safety of Electric Power Systems (2005-2011, MSM). 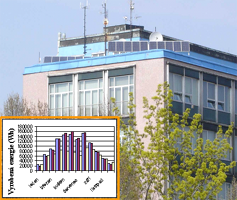 Benda, V. - Macháček, Z.: A Note on Diagnostics of Homogeneity of the Recombination Rate in Large Area Silicon Solar Cells Using Local Irradiation. In 21st European Photovoltaic Solar Energy Conference [CD-ROM]. Munich: WIP - Renewable Energies, 2006, s. 1508-1511. ISBN 3-936338-20-5. Benda, V. - Macháček, Z. - Salinger, J.: Diagnostic of the N+ Large Homogeneity in Large Area Silicon Solar Cells Using Local Irradiation. In 21st European Photovoltaic Solar Energy Conference [CD-ROM]. Munich: WIP - Renewable Energies, 2006, s. 1512-1514. ISBN 3-936338-20-5. Benda, V. - Macháček, Z. - Salinger, J.: Diagnostics of Homogeneity of Individual Layers of Large-Area Silicon Solar Cells Using Local Irradiation. In 25th International Conference on Microelectronic. University of Nis, 2006, s. 285-288. ISBN 1-4244-0116-X. Benda, V.: A Quest for Optimal Education and Training in the Field of Photovoltaics. In 3rd International Workshop on Teaching in Photovoltaics. Praha: Ediční středisko ČVUT, 2006, s. 5.7. ISBN 80.01-03467.4. Benda, V. - Salinger, J. - Macháček, Z.: The Effects of Lattice Imperfections on the Electrical Properties of Solar Cells. In 3rd International Workshop on Teaching in Photovoltaics. Praha: Ediční středisko ČVUT, 2006, s. 109.113. ISBN 80.01-03467.4. Macháček, Z. - Benda, V. - Salinger, J.: Experience with Operating Demonstrational Photovoltaic System FVS 2003A on the Faculty of Electrical Engineering, CTU, Prague. In 3rd International Workshop on Teaching in Photovoltaics. Praha: Ediční středisko ČVUT, 2006, s. 115.118. ISBN 80.01-03467.4. Salinger, J.: The effects of lattice imperfections on the electrical properties of solar cells. In POSTER 2006 - 10th International Student Conference on Electrical Engineering [CD-ROM]. Prague: CTU, Faculty of Electrical Engineering, 2006. Benda, V.: Diagnostics of Homogeneity of Recombination Rate in Individual Layers of Large-Area Silicon Solar Cells Using LBIV Method Diagnostics of Homogeneity of Recombination Rate in Individual Layers of Large-Area Silicon Solar Cells Using LBIV Method. In Twentieth Europe and Photovoltaic Solar Energy Conference - Proceedings of the International Conference held in Barcelona, Spain [CD-ROM]. München: WIP-Renewable Energies, 2005, s. 670-673. ISBN 3-936338-19-1. Benda, V. - Macháček, Z.: An Influence of Operating Temperature on the Photovoltaic System FV 2003A Efficiency. In Applied Electronics 2005 - International Conference Pilsen. Pilsen: University of West Bohemia, 2005, s. 37-40. ISBN 80-7043-369-8.